7. Bifurcation of basilar artery. 11. 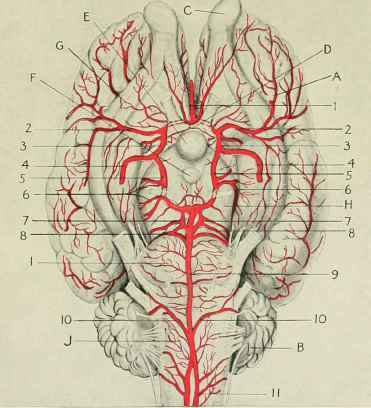 Cerebral branches of cerebro-spinal artery. 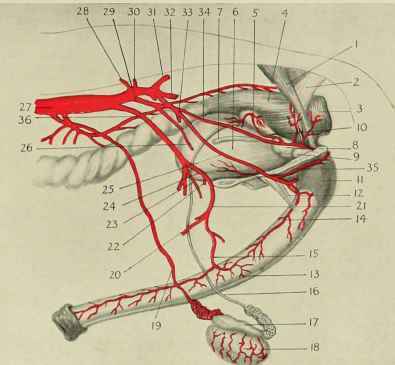 Arteries of the male pelvis. DISTRIBUTION OF THE ARTERIES - II. The Femoral Artery extends from the os pubis above to the lower part of the femur, where its name changes to the popliteal. In its course downward it gives off several considerable branches, which are distributed to the muscles of the thigh. The Popliteal Artery, a continuation of the femoral, lies behind the femoro-tibial articulation or stifle-joint, and in front of the popliteal muscle. After distributing small branches to the structures around, it divides into two parts - the anterior and posterior tibial arteries.